Actually he thinks everything about the way we tax savings is silly. Super contributions are negatively taxed, big time. 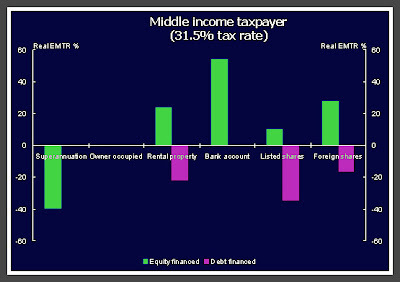 Rental properties and shares are also negatively taxed big-time, but only if they are funded by debt. Meanwhile savings parked in bank accounts are taxed massively - at way above the saver's marginal tax rate. This speech throws the lot into the mix.